Purley town centre has been well known over the past ten years or so, for it's gradual slide into oblivion. The wealthiest of Britain's post codes has suffered the ignominy of its town centre slowly dying under the twin onslaught of the new traffic system which turned a sizeable portion of the high street into a marooned island, and the subtle addition of a Tesco store which killed off all but the charity shops. With the demolition of the long since deserted Astoria cinema all seemed lost for what had become merely a set of traffic lights on the way to Croydon. Over the past few years the only notable improvements have been the renovation of the Jolly Farmers pub, and the long since overdue addition of a KFC and a Blockbusters store. But just when you thought things couldn't get any better we're treated to a new Pizza Express in the old Nat West (so there is another way! ), and now a new pub, the Rectory. Situated directly opposite Blockbusters on the main road, the pub has taken over the premises of the old British Gas kitchen show rooms. The plus point is that the traditional structure is far more suited to a public house than it ever was to the kitchen creations in beech and chrome that would have caused a major pile up if you dared slow down in a vain attempt to catch a glance through the obscured window area. In fact the only useful thing along this stretch of the road was a Midland cash-point, (but there's one round the corner next to Boots so it doesn't matter). The minus point for the pub is of course it's location and near absence of parking, particularly given the eating establishments, Blockbusters and KFC round the back in the 'High Street'. So, having jumped off one of the frequent buses that stop conveniently outside, filled up with cash round at Boots, and booked your table for Pizza Express, in you go to the new pub. It's always surprising to go into what you perceived as being a poky and restricted retail outlet and emerge into a tardis-like, far bigger than expected drinking venue. Witness the Witherspoons round the corner - now what could they do with the old Sainsbury's? The Rectory is large enough to accommodate a couple of hundred, and seems to go back into the building an unbelievably long way. 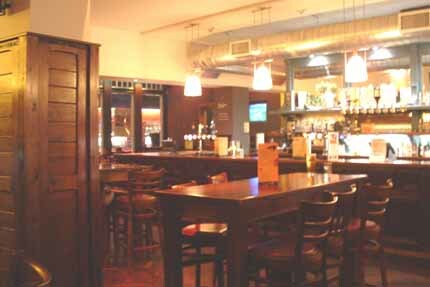 The bar stretches most of this length with extensive seating areas to the front, rear and most of the side facing the bar. This design lends itself to short waiting times and less jostling experiences whilst buying a drink - after all this is Croydon. Always assuming the staff numbers are adequate. Our photos were taken on a week-night to get a feel for the layout, but on a Saturday night the place was far busier. 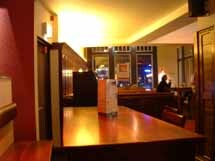 Happily to say the staff passed the bar waiting time test, and generally there was a good balance between the feeling of being in a popular venue, and not getting pressed into a pack of sardines. The music is slightly loud, but conversations are manageable. Bar prices are average, and the toilets are still clean. The atmosphere is relaxed and reasonably sensible, (after all this is Purley don't you know?). There's even a couple of professional looking bouncers on hand for a bit of added security. One of these attends our local gym LA Fitness, (the friendliest club in town), and take our word for it, looks even more formidable without his overcoat on. What more can you say about a pub? The age range is the full spectrum, and it isn't a cattle market. Dress sense on a week-end night has got to be reasonable, but it does give it a feeling of a night-out rather than an alcohol refuelling station. We rate it, Purley has needed it for some time, but if you'd like cheaper drinks, no music, and less than hygienic toilets with a big CCTV camera in the corner, stick to Witherspoons.